Indonesian sports betting is a sore subject in that country. Sports betting is technically illegal, making it very hard for fans to wager on their favorite teams and games. Of course, this ban on sports betting has simply driven most action into the shady underworld along with other activities the authorities deem questionable. The police are constantly struggling with average folks simply looking to get some action down on the games. With the internet, it is easy for unregulated books to open up shop and offer lines to Indonesians. This has led to police watching Wi-Fi hot spots such as bars and restaurants where customers have laptops on and are watching sports. It is rumored that bookies simply use the web as a conduit and direct bettors to certain sites to place bets, and then make transfers via bank accounts discreetly and out of police view. In most cases it is said that bookie and customer never meet. Of course, not every country has banned sports betting, and many sites based in other countries will happily accept Indonesian players. These sites usually quote customers in local odds and deal in local currency, so it may become important for Indonesians to get familiar with American, HK, or European odds and get used to exchange rates in dollars or Euros. Also most books that accept Indonesians are in English only so that may cause inconvenience in some cases. Of course the trade off may be better odds and more secure payments than a shady underground operation. 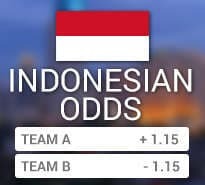 Indonesian Odds are very similar to American odds, they are the same odds just divided by 100. The positive numbers such as +115 are simply expressed as 1.15 so the plus sign is always implied if it is not there. Negative odds in the Indonesian format simply show how much money you must risk in order to win one unit. Usually these odds are displayed to 2 decimal places, sometimes more for certain bets. Using Indonesian-style odds, an even money bet would be quoted as 1.00. Germany is listed at Indonesian odds of -1.15. This means that for each unit won, you would need to risk 1.15 units. This means that for each unit bet, you would win 2.10 units. The big difference between + and – odds is that in the first example you are risking more than one unit to win one unit. In the second example you are risking one unit to win more than one unit. Again, for even money bets you risk $1 and win $1. If you are in Indonesia make sure you are a bit careful of who you deal with and who you bet with and against. Again, it is questionable in the eyes of the law and this causes some unique situations and problems, but as always there are opportunities as well. It makes sense to become familiar with American odds, online calculators, and the English language if you plan on betting in Indonesia. Of course if you are just visiting you may decide to give up sports betting while you are on vacation, but what’s the fun in that?